Are the Coyotes Ready for Playoff Success? If there is one thing the NHL and its fans have learned over the course of the past three seasons, it’s that the Phoenix Coyotes have earned the right to be taken seriously. Saturday night’s victory put an exclamation point on that. With home-ice advantage now assured for the first round, the first-time division champs are called to answer the question: Is this 97 point finish the peak, or can they build on it by passing their first playoff test against the speedy (and experienced) Chicago Blackhawks? On paper, maybe not at first glance. The Hawks are 2 years removed from a Cup win and boast several stars with sterling reputations. But the once mighty Hawks have struggled at times this year, and soap operas about the league subsidy, the ownership situation and fan apathy aside, the Coyotes are one of the NHL’s truly well-managed, blue-chip outfits. They are playoff-bound for the third straight season and no one doubts what they can achieve under coach Dave Tippett’s excellent guidance. Is everything else in place for Lord Stanley to land for the first time in the US Southwest? What are the stakes? Other than the elephant in the room that this may be it for their Glendale address, the Coyotes carry the albatross of not advancing past the first round since 1987 – when they were still the last version of the Winnipeg Jets. To put that in perspective, consider that the Toronto Maple Leafs, owners of the current longest NHL playoff drought, have reached the Conference Final four times since that year. No current team has gone this long without winning a playoff series unless you count the Atlanta/Winnipeg franchise (who started in 1999) and the Columbus Blue Jackets (who started in 2000). Parity is one thing, but you’d be hard-pressed to find a team in hockey that better embodies the phrase “Less is More”. This team has never had the means to sign high-priced free agents, yet is very dynamic heading into these playoffs. Many of its members were thought of as spare parts or past their prime and found a home in the desert, after not living up to expectations elsewhere (Gilbert Brule, Kyle Chipchura, Taylor Pyatt, Mike Smith, Rotislav Klesla, Michael Roszival). The draft was also key for this group: Young guns Martin Hanzal, Mikkel Boedker, Keith Yandle, and Oliver Ekman-Larsson all grew out of smart made picks in the 2001-2008 playoff drought period. These four players under age 26 are starting to turn into a solid and reliable core that pays serious dividends on the score sheet and in the dressing room. Add go-to stalwart veterans like 35 goal scorer Radim Vrbata, 1000-point man Ray Whitney, and veteran rearguards like Derek Morris and Adrian Aucoin (who is approaching 1100 games in his career), and this might just be a solved puzzle. The last two hundred-plus point seasons have amounted to nothing because of back-to-back collisions with the well-oiled Detroit Red Wings machine in the first playoff round. The absence of captain Shane Doan hampered the Cinderella vibe in 2009-2010 and last year, well, the Wings were just playing too much like themselves to go out like that. This year, with their combination of experience, skill and maturity, there’s no reason the ‘Yotes can’t go toe to toe with the Blues, Canucks, Kings, or Wings, or whoever else they need to, if they can get the first round monkey off their backs. If the defence plays like it can with evolving elite D-men like Yandle and Ekman-Larsson leading the charge, and the balanced scoring comes through with clutch goals, this team is one of the better odds to get through two plus rounds. 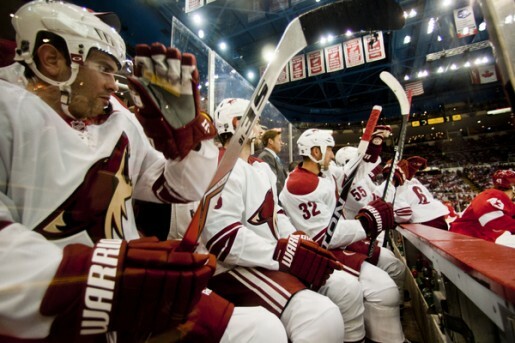 Shane Doan is an example of what happens when a team just hangs on to a great player. Seventeen years on this roster and the last standing Jet who made the move in ’96, he’s been the face and the constant of this franchise through it all. Surviving an eight year long rebuild might not have been such a bad thing, if he can taste playoff success this year (His situation makes you wonder if maybe Jarome Iginla and the Calgary Flames aren’t on the wrong track after all). Of course for every Dave Andreychuk story, there are legions of players on the wrong side of 35 who retired cup-less. Doan is very settled down in the Phoenix area, so with the uncertainty surrounding the club’s future, this would be the year he needs to bring it like he’s never brought it before. At 37, does he have enough gas left in the tank to do it? Prior to this year, Mike Smith might have owed some of his reputation as an extremely average goalie to his extremely average name, but he mostly earned it. His pre-Phoenix record does not indicate a netminder ready to go deep in the playoffs. His career high in games was 41 for the Tampa Bay Lightning in 2008-2009, and his record that year was sub .500. This year, of course, he has posted Vezina-like numbers and his name has been floated for the trophy, but that only takes his regular season performance into account. Normally you do not win the Cup without some unbelievable saves, and whether Smith can make them through four rounds of playoff war is the team’s biggest question mark. One thing the Vancouver Canucks squad that lost their 2011 Cup bid lacked was a gritty veteran. It is debatable whether a squad wins Lord Stanley’s trophy without one – the Boston Bruins had theirs in Mark Recchi. Ray Whitney not only brings his 20 years of experience but clearly still has plenty of scoring flair as the team’s 39 year old leading scorer, finishing in the NHL’s top 20; as a result, the Coyotes probably have the biggest edge among all playoff teams in this essential ingredient to a winning recipe. As we’ve seen in previous years, the best 6 D-men in the world can’t win you the Cup if one of them goes down during a 22-28 game epic battle. There are valuable guys on defence for the ‘Yotes that don’t start in Chris Summers, David Schlemko, and top prospect David Rundblad – young and talented all. One of them could prove to be valuable insurance should one of the studs go down. This is probably one of the deeper defences in the league, and with guys like these in reserve it is doubtful to be an Achilles heel. So here is a team on the bubble: it has all the keys it needs to finally break the cycle of underachievement – but can they do it? The West is very competitive and although this team is good, it will come down to intangibles like grit and heart. Only time will tell.